Snow and ice forced everyone indoors last week with nothing to do but stoke the fire, use up the canned goods and encourage the thermometer to rise! Luckily, the imperfect weather coincided with the need for a new necklace to wear to a gala event this week. When an occasion calls for fabulousness, I turn to the designs of Nancy Cain. With her classic, refined sense of style, Nancy's Crystal Twilight necklace from the August 2010 issue of Beadwork is sophisticated, elegant and contemporary and has been at the top of my personal to-do list since I first opened the magazine. 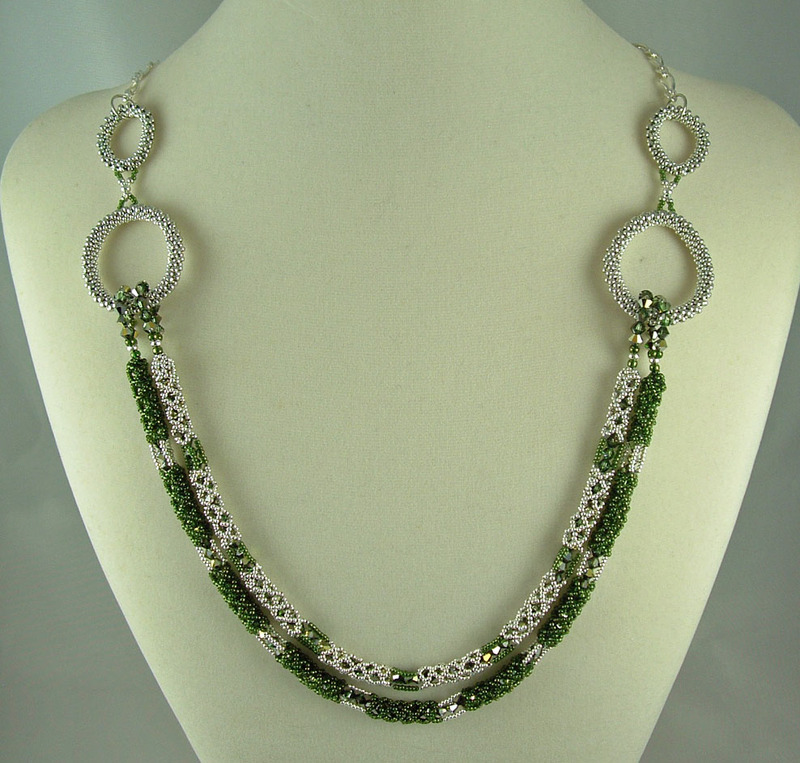 My outfit is a shimmery olive green, so I jumped at the chance to work the design with my favorite Peridot Sahara crystals encased in metallic olive and sterling silver seed beads. The pattern quickly becomes second nature and with alternating sections of netting and fringe, never threatens to verge on tedious. The design finishes up with delightful sterling silver peyote rings. Qué collar tan original, es muy, muy bonito, enhorabuena! !